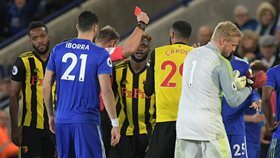 Watford manager Javi Gracia has confirmed that the club will appeal the red card received by French midfielder Etienne Capoue in the closing minutes of their 2-0 loss to Leicester City in a Premier League match at the King Power Stadium on Saturday. Kelechi Iheanacho's name has been mentioned again, this time by the Hornets boss, who wants the incident reviewed by the English Football Association. Capoue was sent off for what appeared to be a strong two-footed challenge on Iheanacho but the Nigeria international admitted after the game that no contact was made. ''I saw it clear because it was in front of me, but I prefer not to say anything, only what Iheanacho said,'' Gracia said to the official website of Watford. ''He said Capoue didn't touch him. That is more important than what I can say. Yes, we will appeal. Capoue will miss Premier League games against Manchester City, Everton and Cardiff City if Watford's appeal is unsuccessful.